Discounted Miller MIG welders, stick welders, TIG welders, engine driven welders, spot welders, plasma cutters, wire feeders, fume extractors and accessories. ESAB brands now include leading names like Victor®, TWECO®, Thermal Arc® and Thermal Dynamics®. Discount Hobart MIG Welders, TIG Welders, engine driven welders, plasma cutters & accessories. Miller and Hobart MIG welders. Miller, Hobart and Thermal Arc® TIG welders, including Miller Syncrowave & Dynasty TIG welders. These welders can do it all: Stick, TIG, MIG, and Flux Cored welding. 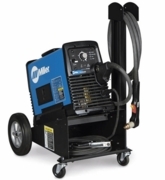 Choose from Miller and Thermal Arc multiprocess welders. Miller and Thermal Arc stick welders, including Miller CST and Maxstar stick welders. Miller plasma cutters, Hobart plasma cutters and Thermal Dynamics plasma cutters. Miller spot welders and accessories are built tough to deliver smooth, reliable performance. Miller & Hobart engine driven welders/generators are the most rugged and reliable on the market. Miller provides the smoothest feeding, most reliable and easiest to operate spoolguns and wire feed systems in the industry. Miller and Ace brands of welding fume extractors. Cyberweld offers discount welders and plasma cutters from leading brands like Miller, Hobart and Thermal Arc. Choose from a wide variety of MIG welders, TIG welders, stick welders, engine-driven welders and plasma cutters for the welding professional or the "Do-It-Yourself" welder. Miller welders are manufactured in the U.S.A. and have been the industry leaders in quality, durability and performance for over 75 years. Miller welders and plasma cutters are industrial grade power sources for the professional welder. The Hobart brand of welders and plasma cutters represents industrial quality at an economical price. While Thermal Arc® welders and Thermal Dynamics® plasma cutters are produced by the most recognized name in welding; Victor®.